I made a zero-mile meal for dinner tonight, after we went mushroom hunting in our woods and scored loads and loads of oyster mushrooms. We found a dead cherry tree just covered in them, and they were right at prime in both size and age. Sweet! Actually, oyster mushrooms are slightly sweet. We’ve found them in the woods before, but we got pounds this time. I guess that’s one good thing for all the rain we’ve had this summer. There’s no hay anywhere to be found, but we sure do have the mushrooms. We found a good batch of black trumpet mushrooms as well, but if we’d managed to get out a couple of days earlier, we’d have scored a truckload of them. These were mostly gone by, sadly, but wow were there lots and lots of them. I am going to try to make time for a mid-week mushroom hunt, I think, and see how that patch is doing. So I wanted to use the fresh oyster mushrooms for dinner, and went googling around to see what I could see. 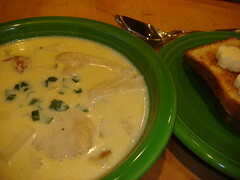 I found this recipe for Oyster Mushroom Chowder and thought I would try it. I sent poor Frank out to the garden in the pouring rain for new potatoes and an onion. I used milk and cream from Ella Mae. The eggs came from our hens. It’s a really nice recipe that lets the delicate flavor of the mushrooms really shine. It was surprisingly filling, too. All I served it with was a slice of toasted homemade bread, but it just hit the spot. A perfect meal for a rainy stormy afternoon. This entry was posted in Black Trumpet Mushroom, Food, Mushrooms, oyster. Bookmark the permalink. Post a comment or leave a trackback: Trackback URL.